WIESBADEN, Germany (June 12, 2012) --- V Corps marked its inactivation after nearly a century of prestigious service to the U.S. Army with a ceremony at Wiesbaden's Schloss Biebrich, June 12. The ceremony served to inactivate V Corps and to give a final salute to the unit for everything it has accomplished in its 95-year history. It was also a time to present two campaign steamers to the corps for its service. A Meritorious Unit Commendation streamer was presented for the unit's most recent deployment serving as the of NATO's International Security Assistance Force Joint Command, or IJC, in Afghanistan. The second streamer, the Superior Army Unit Award, honors the unit for its efforts during the reconstitution, modularization and relocation of V Corps to Wiesbaden from Heidelberg. During the ceremony, V Corps Commander Lt. Gen. James L. Terry and Corps Command Sgt. 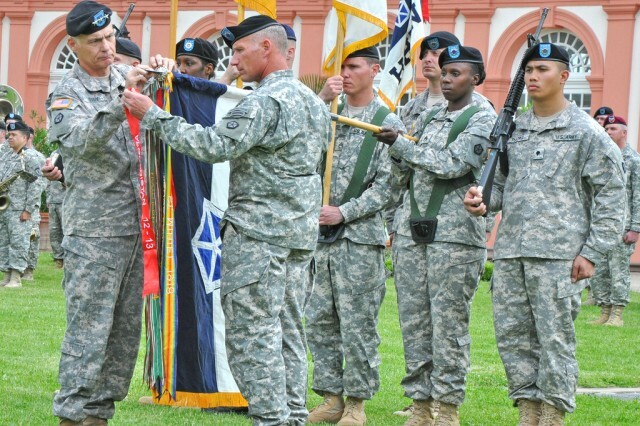 Maj. William Johnson placed the streamers on the unit's colors and cased the banner for inactivation. Terry spoke about how the corps has provided U.S. Army Europe, known as USAREUR, and the U.S. Army with unparalleled support and helped to promote regional and global security and cooperation for nearly a century. Terry also thanked members of V Corps for their accomplishments providing the IJC leadership and staff during their recent deployment. "We will put the colors at rest, and just like our Soldiers, we will stand ready," said Terry. "If the nation calls, we will be ready." Terry also thanked the many German citizens who have helped the unit and its Soldiers during V Corps' long history in Germany. "It has been a great experience for all of the Soldiers who have served V Corps here in Germany," said Terry. "The German nation has really reached out to us and I think the most important thing to us is that we will leave here being friends with the German people." USAREUR's commanding officer, Lt. Gen. Donald M. Campbell Jr., spoke as well, and expressed his gratitude for V Corps and its members past and present, noting that their recent achievements in Afghanistan portray the dedicated service that has always been a hallmark of V Corps. "You have my heartfelt thanks for the recent difficult mission that you have undertaken and seen to completion as part of V Corps," said Campbell. "You did this while always caring for your fellow Soldiers, civilians and their families. No one could ask or be more proud of what you have accomplished and done." V Corps' history dates back to 1918, when the unit was activated during World War I in combat in France. By the end of the war the corps had fought in the Lorraine, St. Mihiel and Meuse-Argonne campaigns, and was dubbed the "Victory Corps." It later took part in the World War II D-Day invasion and liberation of Europe; defended Western Europe during the Cold War; saw service in the Balkans and in Iraq and Afghanistan; and has helped build U.S. bonds with America's multinational partners across Europe. The corps inactivation is a major milestone in U.S. Army Europe's transformation to a more agile force built around a cavalry brigade equipped with highly mobile Stryker combat vehicles and an airborne infantry brigade. Originally announced in 2004, with final revisions published in February, 2012, the Department of Defense's posture plans for USAREUR called for the inactivation of the corps headquarters, as well as the 172nd and 170th Infantry Brigades. 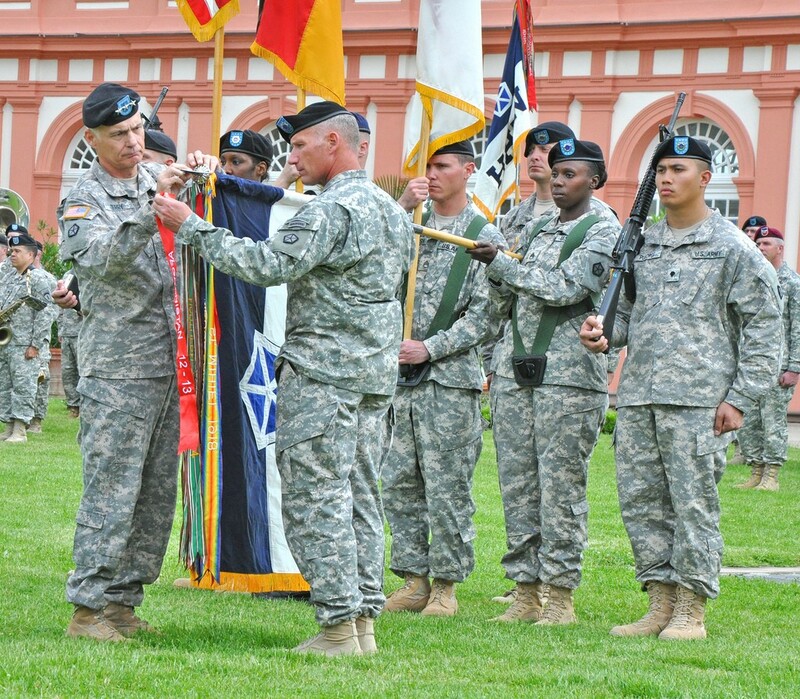 The 170th inactivated in Baumholder, Germany, in October 2012 and V Corps' inactivation will be complete by October 2013.